I am participating in the Summer Coffee Lovers Blog Hop today. I LOVE my coffee! Cannot start a day without one. And cannot survive the evening without an afternoon dose 😉 So this hop is perfect tribute to coffee. Lol! There is a lot of sponsors also giving away fabulous prizes. Eeek! More exciting and fun! I have used Penny Black’s Mocha Moments stamp set to make my card. The images are stamped using Versafine Black ink and watercoloured using Zig Clean Colour Real Brush pens. The sentiment is also from the same stamp set. I trimmed the watercolour panel and adhered on the card front with a strip of pattern paper from Beau Jardins 6 x 6 paper pad also from Penny Black. I added black twine with a bow and Onyx black sequins from Pretty Pink Posh to tie in the colours together. Play along the Summer Coffee Lovers Blog Hop. There are fabulous prizes to be won and it is so much fun. Not sure y my first comment didn't appear. Here I go again : loveeeeee this card, d image and colouring. Uve tempted me to try out colouring gayatri. 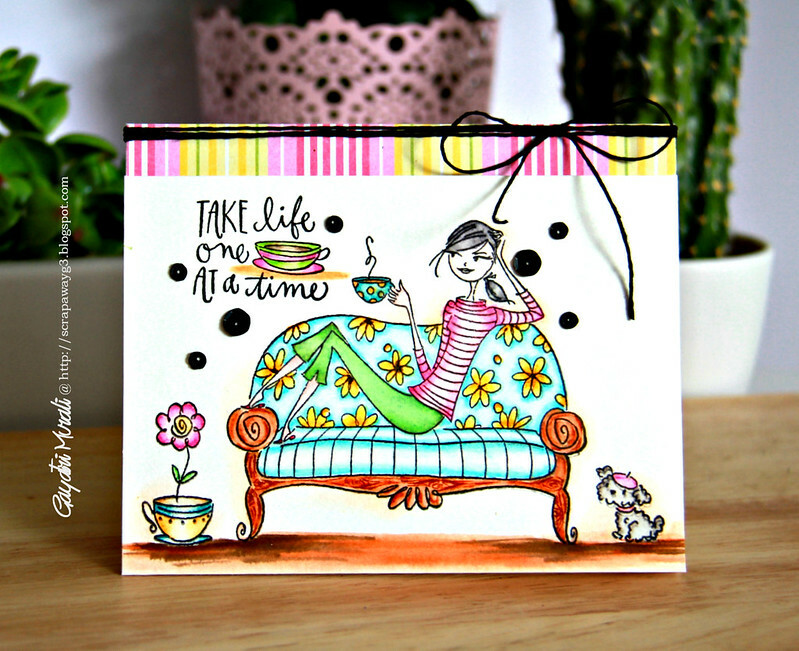 What a fun coffee card, Gayatri,love the colors you used! Hope you are enjoying the hop! I love this image and love how you colored her! Such a fun card! very cool image and love your coloring..
Yay! So happy to have you link up Gayatri! What a fun card, love the colors and that image! 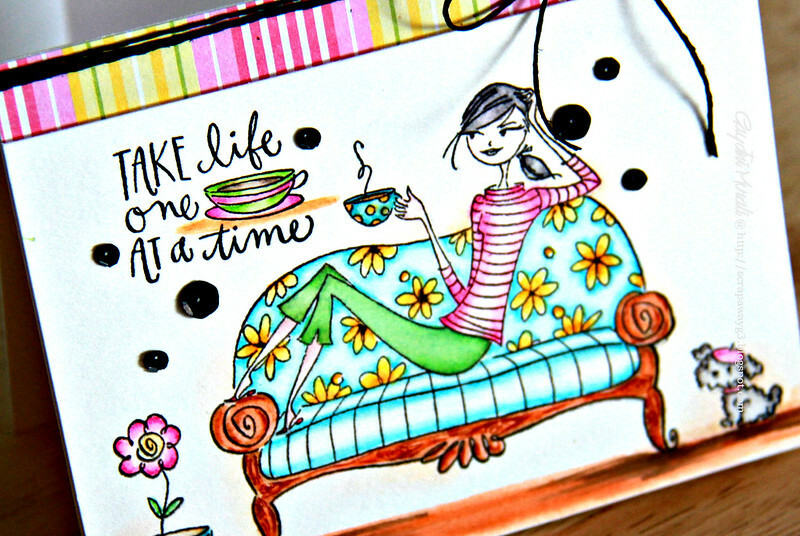 Wonderful coloring — I love that sentiment with the cup in it! FAB card, Gayatri! Love it! Great card! And OMG I was eyeing that stamp set for forever in my local crafting store. I was so close to buying it last week! What a fab stamp and coloring job! Wonderful stamp set. Makes for a fun card. OMG! I love that image! You colored it wonderfully and I am so glad that you used this stamp set because I never saw it before and now I want it! this rocks, fab card, great cool image ! Such a fun and super cute card Gayatri. Love the bright coloring. This is so beyond lovely. Your coloring is sheer perfection and you've captured the easy, bright feeling of summer to a T! What a fun and colorful card with beautiful coloring. That little poodle with the beret cracks me up! Oh fabulous!! Great scene you created! Seriously awesome job coloring…you always amaze me! This is just so summery and gorgeous! Stinking cute creation, fab coloring and layering and love the little embellishments too!!! This is so cute! I love how you've colored this image! Adorable card! Fun and colorful! Oh my goodness, what a sweet image! She is too cute and you have colored her up beautifully! I love everything about this adorable card! This made me smile! Great image, and love your bright colors! such fun coloring! This is really delightful! Just beautiful! I love the vivid colors and the layout- that striped dp is gorgeous! adorable card and great coloring! OMGosh this is so adorable!!! I must have this stamp set, thanks for sharing. Wow! Gorgeous coloring on this sweet card! Hi Gayatri!! It is so fun!!! TFS! !